What flavors can I choose from and how many do you have? We offer over 90 different premium snow cone and shaved ice flavors. Check out the complete flavor list. What are the most popular shaved ice and snow cone flavors? Our top-selling flavors are denoted on our syrup flavor list. Where can I find nutritional information on the syrup? 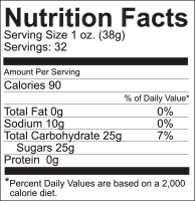 Each syrup flavor includes nutrition information on the label. While the main ingredients are consistent throughout each batch of syrup, there are slight differences in each one to adjust the flavor. We are developing great resource for identifying specific ingredients, possible allergens and other helpful information. This information will be available soon. In the meantime, please give us a call for nutrition information. What is the shelf life of the syrup? Each bottle of syrup is printed with a "Use By" date. We ensure the quality and taste will be nothing less than perfect until that date. Upon delivery to your door, you can expect a minimum of 1 year remaining on the shelf life, if not more. Do I need to refrigerate the syrup once I open it? No. The syrup does not need refrigeration, however, you may refrigerate if you prefer. We suggest storing the syrup in a cool and dark place. How many servings can I get from a bottle of shaved ice syrup? This number depends on the size of the serving. Below are some recommended amounts. Keep in mind, pints are 16 ounces, quarts are 32 ounces and gallons are 128 ounces. No. Our syrup is not Kosher Certified. What's the difference between Shaved Ice and Snow Cones? Good question. We've got an entire page dedicated to this. Do you have any recipes I can use to make rainbow shaved ice? Of course! Check out our fun recipes for rainbow and other flavor combinations. Shipping is based on weight, dimensions and distance from our warehouse to the destination. We can gladly provide shipping costs over the phone or you may add the items to your cart and our website will calculate shipping based on your items and location. Unfortunately, we get this question a lot. Shipping costs can get expensive, depending on the items ordered. We charge UPS rates and never inflate the costs. The syrups tend to get heavy and take up a lot of space in boxes. In order to keep our prices low, we can never offer free shipping or discounted shipping. Please know that we always strive to keep shipping costs low along with the prices of our products. If your order is received before 2:00 pm Eastern Time, it typically ships the same business day. Any orders after 2:00 pm will ship the next business day. Transit times are based on the distance from our warehouse to the shipping address. Every item we sell ships from our facility in North Carolina. UPS Ground may take 1-6 business days. You may always choose an alternate shipping method if you need expedited shipping. We offer 3-Day Select, 2nd Day Air and Next Day Air service. A tracking number is sent via email for you to track your package(s). Our products can be purchased online or by phone and they ship from North Carolina. We do not sell any of our products in retail stores. Visit our Facebook Page to find any active coupons or join our surf club to be one of the first to receive information on coupons and other deals. A link to our return policy can be found at the bottom of any page on our website. You may cancel your order, however, we recommend doing so quickly. We don't waste anytime packaging your order and sending it to you. If your order has already been scanned into the UPS system, you can easily follow our return policy upon arrival to the destination. Please contact us for wholesale prices. If you're interested in opening a shaved ice business, visit our sister site at www.1-800-Shaved-Ice.com. Can I establish an account? Do you accept Purchase Orders? We can only setup PO accounts for schools and other government agencies.�Please call us at 1-800-620-2869 for additional information.